The first book of its kind to ink the role of organizational leaders with the role of fundraising leader. 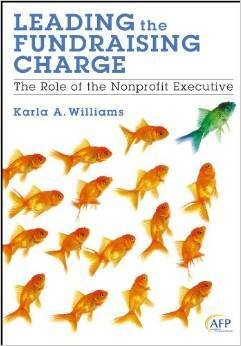 It explores the multifaceted elements and approaches that will cause donors to resonate with your organization. Solicitation Concepts: Evaluate the strength of your case, campaigns, and communications. As I was transitioning from a 20 year career in church mission and programming into a new one of fundraising, my first teacher was Karla Williams. So many of the principles that were in Fundraising 101 are evident in Leading the Fundraising Charge. Years after that course there is so much more in this book which reflects Karla’s life commitment to the importance of learning from every situation in the field of development. If I had one book that I wanted to give to CEO’s, Board Chairs, and Development Committee’s this would be it. Actually, there is so much in each chapter, I would select portions so they could be fully savored and digested. This is one book of remarkable wisdom and knowledge. I don’t know how Karla Williams managed to distill decades of wisdom into fewer than 250 pages in her book (well, I really do know: she’s at the top of our profession as leader, teacher and holder of the ACFRE credential). Karla takes four key words and plays off of them: Essence, Enigma, Energy, and Effect. But the one word that is key is Energy, which she applies to fundraising leadership and practice. Executive leaders need to understand that there are positive attitudes and negative attitudes that come into play. I have seen this in my own work where a top executive admin ungraciously spurned fundraisers trying to see the CEO. Don’t be fooled by chapters titled Philanthropy Concepts, Development Concepts, Relationship Concepts, and Solicitation Concepts. After a brief introduction to the topic, Karla delves deeply into the subject, as befits the knowledge level required of a CEO. This is mountain moxie brought down to the city where every nonprofit executive can imbibe of its goodness. Drink up! This book demonstrates that annual giving is the core of an integrated development program, and that is success depends on the extent to which fundraisers treat their donors as individuals with distinct needs and interests, rather than mass marketing their organizational cause. It provides a review of the time-honored fundraising principles, with all their variations. It recommends the use of marketing theory as the most natural donor-focused approach to build a sustainable, integrated development program. Further, the book offers a summary of the current research on internal donors motivations and external motivating elicitors. It uncovers working case examples where new approaches are being successfully than any other aspect of fundraising. Provide a higher level of donor communications, recognition, and stewardship. 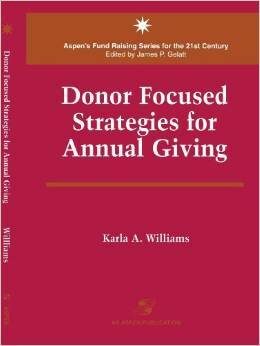 Karla Williams has introduced an extremely practical and well written book for those of us who seek to raise the bar in the arena of Annual Funds and Donor Development. I have many, many books in my library that focus on fundraising strategies, and this is the primary one that I will be using to train my staff and volunteers. Why? Ms. Williams not only presents a world-view that is compatible with our organization, but then presents very practical, step by step strategies to implement this vision of donor development. She begins with a fairly in depth and clear presentation of the history of fundraising (which helps to put things into perspective) and then moves on to what she believes is the most effective and responsible paradigm for funding nonprofits: one that honors and respects the donor constituency in addition to raising the needed funds for our various causes. The book features numerous case illustrations, easy to interpret graphs, and an integrated annual development strategy that can be fine tuned for any organization. Bottom line: Yes it may seem expensive, but it is simply one of *the* best resources for annual funds on the market today. I highly recommend this book. The author has a very accessible, clear writing style. She lays out the pros and cons of various options very well. It has really helped me plan and improve my annual campaign. If you have taken a class from Karla, you would know that you need this book – very practical, concise, and full of good things for fundraisers to do. Although she is giving it an “annual giving” perspective, it really will be helpful for any kind of fundraising. Buy it! You will be glad you did. AFP Leadership. Position or Proposition? Giving is all about community. Americans give money, volunteer and serve on boards mainly because they want to help make their communities better places to live and work. But fundraising, the flip side of giving, is not always about community: When they ask prospective donors for money, far too many nonprofit staff and volunteer leaders focus on fundraising techniques and the needs of the nonprofit and, sometimes, of the donor, rather than on the needs of the community. That needs to change if nonprofits expect to do a better job raising money so their organizations can better serve people and places in need.